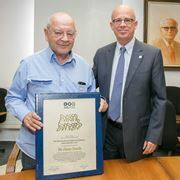 In recognition of his indelible mark in the field of integrated optics technology, Tel Aviv University awarded an honorary doctorate to Prof. Amnon Yariv, the Martin and Eileen Summerfield Professor of Applied Physics and Electrical Engineering at the California Institute of Technology (CalTech). 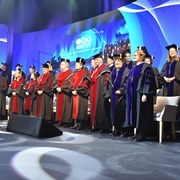 The conferment ceremony was held at the Raya and Joseph Jaglom Auditorium in the George S. Wise Senate Building. 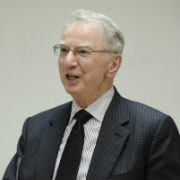 Prof. Yariv is a member of and visiting lecturer at TAU’s Mortimer and Raymond Sackler Institute of Advanced Studies. With a plethora of awards and honors, including the prestigious National Medal of Science presented by President Barak Obama in 2010, Prof. Yariv is widely credited with transforming the optical communications industry. His research group, which focuses on the theoretical and technological underpinning of optical communication, has generated numerous technologies, not the least of which was the invention of the semiconductor distributed feedback laser. This device enabled the transmission of mass data via phone, video, cable and the Internet, which has profoundly influenced society and culture across the globe. Israeli-born Prof. Yariv fought in Israel’s War of Independence from 1948-1950, before leaving for the US. He completed his BSc, MSc and PhD in electrical engineering at the University of California, Berkeley, taking on his first role as Research Associate there in 1958. He then spent five years on the technical staff of Bell Telephone Laboratories, before returning to academia in 1964 as a professor of electrical engineering at CalTech, where he remains today. In his tribute to Prof. Yariv, TAU Rector Yaron Oz spoke of how TAU awards honorary doctorates to those who are visionaries in their field — to those who create new realities instead of merely improving on what exists. “The ability to set a vision far beyond imagination and bridge the gap between vision and reality, this is the paths of excellence that led you here today,” said Prof. Oz. Presenting the award along with Prof. Oz was TAU Vice President Raanan Rein. Among the guests in attendance were: Prof. Yossi Rosenwaks, Dean of the Iby and Aladar Fleischman Faculty of Engineering; Prof. Avraham Gover, Head, Israeli Free Electron Laser Knowledge Center for Radiation Sources and Applications, Faculty of Engineering; and Prof. (Emeritus) Emanuel Marom, former Dean of Engineering.